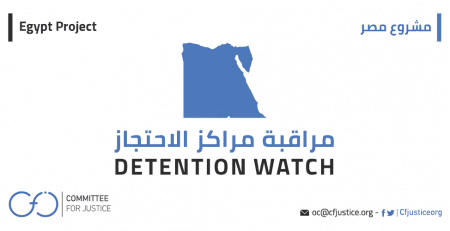 Egypt: The United Nations working group on enforced disappearances affirms the systematic commitment of such crimes by Egyptian authorities against activists and human rights defenders. Committee for Justice (CFJ) said that the annual report issued by the United Nations Working Group on Enforced and Involuntary Disappearances documented the continuity of such crime of enforced disappearance in Egypt against activists, human rights defenders as well as civilians. The report also noted the continuous lack of cooperation from the Egyptian authorities in its “procedures” in parallel with the shrinkage of civil society space in Egypt and the targeting of human rights activists who work on documenting the crime of enforced disappearance by the authorities. The committee emphasized that the UN Group worked on the largest number of enforced disappearance complaints belonging to Egypt since the group’s establishment in the 1980s, covering a total of 173 cases under urgent procedures and 14 cases under regular procedures, with 285 cases still under review. 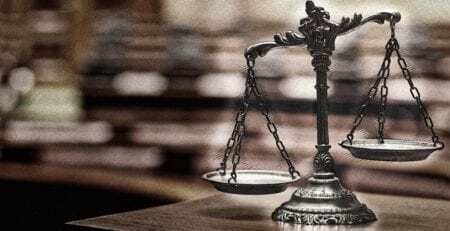 In total, the Egyptian authorities revealed the situation of 54 cases, besides the NGO sources clarifying that of 27 other cases. According to CFJ’s monitoring and documentation data covering the period from August 2017 to August 2018: 1989 cases of enforced disappearances were monitored, of which 1830 cases had reappeared -as per the team’s monitoring activities-. In total, our team was able to fully document 318 cases, submitting 141 complaints to the international mechanisms to assist victims of enforced disappearance, while none of the hundreds of police reports filed by victims or their representatives were seriously investigated by the authorities. According to the report obtained by CFJ, the working group rejected Egypt’s lengthy reply to its urgent appeal on 3 October 2017 concerning the detention of Egyptian human rights activist ‘Ibrahim Metwally’, head of the “Association of the families of the disappeared”, while he was on his way to a meeting with the Working Group at its 113th session in Geneva. 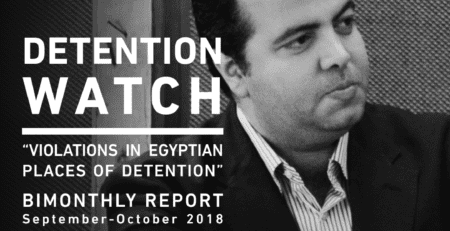 In the report, the working group “reiterates that Mr. Metwally’s arrest and the charges against him point to an act of reprisal against him for his collaboration with a United Nations human rights mechanism, and a deliberate obstruction of his legitimate human right to seek to know the fate and whereabouts of his son and other disappeared persons in Egypt “. The Working Group added that, as provided for in article 13 of the Declaration, those involved in the investigation of enforced disappearance should be protected against ill-treatment, intimidation or reprisal, noting that the Egyptian authorities had been asked for updated information on the case of Mr. Ibrahim Metwally . The Working Group noted that while it appreciated the Egyptian Government’s response to a number of its correspondences and the participation of the Egyptian Mission in the regular meetings of the Group at its 113th and 115th sessions, it remained concerned about the number of new cases it was still receiving. The Working Group stressed that, despite repeated calls to address what appears to be a systematic problem in Egypt regarding short-term enforced disappearances, the situation did not seem to have improved. The Egyptian Government is thus obliged to take urgent action in that regard, including taking all necessary measures to prevent the occurrence of similar cases in the future. The Working Group also noted that clarifying the situation of many cases does not exempt the Egyptian Government from its obligations on taking all such measures to prevent the reoccurrence of similar future crimes. In this regard, Egypt was one of the countries under review by the United Nations Working Group on Enforced or Involuntary Disappearances during the current session, where the Working Group confirmed that between 10 to 14 September 2018, 840 cases from 46 countries -Including Egypt- were inspected. The Working Group deplored the shrinking civil society space in Egypt and expressed its grave concern that this would discourage organizations and individuals from reporting on alleged enforced disappearances. It also pointed out that Egypt is one of the top countries targeting human rights defenders who fight against the crime of enforced disappearance. The Working Group transmitted 9 prompt intervention communications addressing. allegations of harassment of and/ or threats to human rights defenders and relatives of disappeared persons, where Egypt came first among the countries addressed with a total of four requests. The Committee for Justice affirms that the Egyptian regime does not have the intention of managing this topic with the seriousness that should guide Egypt’s international obligations towards the UN Working Group on Enforced or Involuntary Disappearances. This is clearly evident through ignored repeated requests for visits to Egypt made by the Working Group to investigate provided allegations, which have so far reached 6 requests (most recent of which being on 18 January 2018). This observation overshadows the involvement of the Egyptian authorities in covering up and protecting the perpetrators of such crimes and their affiliates. 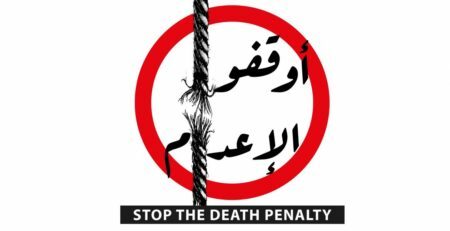 Egyptian authorities must stop death sentences built on human rights violations. No more violations of the right to a fair trial. 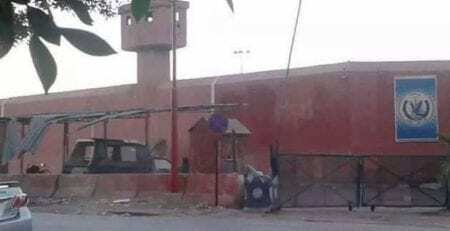 The Degrading Treatment of Death Row Detainees in Alabadia Prison.